The basics on the group that has Glenn Beck going batshit. As the revolutionary upsurge in Egypt builds toward its conclusion, some of the key questions involve the role of the Muslim Brotherhood—the Islamic movement that has been characterized as anything from a benign prodemocracy force to a terrorist-inclined radical group with designs on establishing a global Caliphate. What, exactly, is the Brotherhood? How strong is it inside Egypt? If the regime falls, will the Brotherhood take over, or is Egypt too modern, too secular, and too diverse to tolerate an Islamist-dominated government? And finally, if the Brothers did seize power, either in the streets or through elections, what kind of rulers might they be? To answer these questions, we need some grounding in history. For the next five decades, the Muslim Brotherhood would serve as a battering ram against nationalists and communists. Despite the Brothers’ Islam-based anti-imperialism, the group often ended up making common cause with the colonial British. It functioned as an intelligence agency, infiltrating left-wing and nationalist groups. But it was also fiercely independent, at times clashing violently with the ruling authorities. On several occasions, Ikhwan assassins murdered top Egyptian officials, including Prime Minister Mahmoud Fahmi al-Nuqrashi in 1948. (Brotherhood founder Banna was assassinated by agents of the regime just weeks later). In the 1950s, the Brothers initially coexisted with the revolutionary regime of Gamal Abdel Nasser, who toppled the king in 1952. Gradually, however, Nasser sidelined the group, and by 1954 Nasser and the Brotherhood were at war. Reverting to its terrorism days, the Brothers twice tried to assassinate Nasser. The Brotherhood’s vicious anti-Nasserism synced up conveniently with British and then American hatred for Nasser, and there’s evidence that London spies may have collaborated with the Brotherhood against Nasser. By then, the group’s chief international organizer and best-known official was Said Ramadan, the son-in-law of Hassan al-Banna. Ramadan had come to the attention of both the CIA and MI-6, the British intelligence service. In researching my book, Devil’s Game: How the United States Helped Unleash Fundamentalist Islam, I came across an unusual photograph that showed Ramadan with President Eisenhower in the Oval Office. By then, or soon after, Ramadan had likely been recruited as a CIA agent. 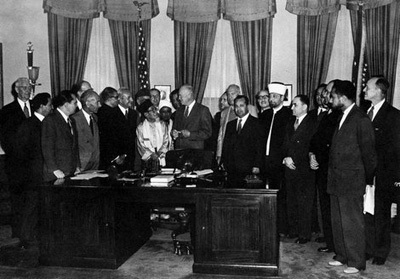 President Dwight D. Eisenhower in the Oval Office with a group of Muslim delegates, 1953. Said Ramadan is second from the right.Wall Street Journal reporter Ian Johnson has since documented the close ties between Ramadan and various Western intelligence services in his book, A Mosque in Munich. In a recent article in the New York Review of Books, Johnson writes: “By the end of the decade, the CIA was overtly backing Ramadan.” On the run from Nasser, Ramadan—a peripatetic traveler who’d been the chief organizer of the Muslim Brotherhood’s chapters in Syria, Lebanon, Jordan, Palestine, and Pakistan—settled in Geneva, Switzerland, where he established an Islamic Center that for a quarter-century would serve as a hub for the Brotherhood’s worldwide efforts. From its early days, the Brotherhood was financed generously by the Kingdom of Saudi Arabia, which appreciated its ultra-conservative politics and its virulent hatred of Arab communists. Hermann Eilts, who served as US ambassador to both Saudi Arabia and Egypt, told me that he once encountered Hassan al-Banna in the offices of the Saudi deputy minister of finance in 1948. “He used to come to Saudi Arabia for money,” Eilts said. Does Egypt Have the Brotherhood to Thank for Mubarak? Guided by Kamal Adham, the head of Saudi Arabia’s intelligence service, Anwar Sadat—who’d been a member of the Brotherhood in the 1940s—reintroduced the Ikhwan to Egypt. At the time, Sadat had no political base, and he wanted to undermine the influence of the Nasserites and the communists. To that end, he calculatedly unleashed the power of right-wing political Islam. The Brotherhood’s youth wing, often using physical force to intimidate its opponents, helped Sadat recapture ideological control of Egypt’s universities. The Brotherhood also took the reins of Egypt’s professional societies—doctors’, engineers’, and lawyers’ groups. But because Sadat did not formally allow the Ikhwan to set up a political party, it fragmented into various components, some of which—inspired by Sayyid Qutb, a violent Salafi theoretician who was hanged by Nasser—turned to nihilist violence. One of these offshoots murdered Sadat in 1981, and then Vice President Mubarak took over. For Mubarak, the Brotherhood served primarily one purpose: To justify Egypt’s unending state of emergency. Like clockwork, Mubarak would tell his critics, foreign and domestic: It’s me or the Brotherhood. Though formally banned in Egypt, the organization has been by turns tolerated and repressed—its members arrested, then released, then arrested again. Where’s the US Been in All of This? Throughout the Mubarak era, the United States has had a contradictory, uncertain policy toward the Muslim Brotherhood. Robert Pelletreau, who served as ambassador to Egypt from 1991 to 1993, told me in an interview several years ago that he sought to open a dialogue with the group during his tenure in Cairo, and when Mubarak visited Washington, Pelletreau asked then-Secretary of State Warren Christopher to raise the issue with the Egyptian leader. “I’ll never forget what happened next,” he told me. “Mubarak sat up sharply, rigidly. ‘These people killed my predecessor!’ Then he raised this huge fist, and he slammed it down on the table hard, and everything on the table jumped and rattled. Bang! ‘When they come out, we have to hit them. '” Edward Walker, who succeeded Pelletreau as US envoy in Cairo, was far more skeptical about dialogue with the Brotherhood, and for the most part, he supported Mubarak’s efforts to suppress it. “I can’t count the number of times Mubarak yelled at me about how the British were giving the Muslim Brotherhood and other Islamists safe haven,” Walker told me in 2005. Since then, there’s been little or no official contact between the US and the Muslim Brotherhood (though a few years ago, the Bush administration convened a series of meetings to discuss whether or not to engage them). The Obama administration has walked a fine line, too, signaling a willingness to make sure that the Brotherhood is included in any negotiations with the Egyptian military, while declaring that there have been no direct contacts between US officials and the Brothers. Obama administration officials have also expressed concern about the possibility that the group could come out on top once the dust settles in Cairo. By the 1990s, despite the off-again, on-again repression by Mubarak’s regime, the Brotherhood had completed what many observers say was a transformation. Step by step, its leadership renounced its violent past, engaged in politics, and tried to reinvent itself as a collection of community organizers who operated clinics and food banks, building a network of Islamic banks and companies. Writing last week in Foreign Affairs, Carrie Rosefsky Wickham noted: “Although the Brotherhood entered the political system in order to change it, it ended up being changed by the system.” In the 2005 parliamentary elections, the Muslim Brotherhood won 88 seats—20 percent of the Parliament—and probably could have won even more had it run more candidates. All of a sudden, the Brothers had emerged as Egypt’s most potent opposition force. Though they still faced the wrath of the secret police—and in last year’s parliamentary elections, the game was so rigged that the Brotherhood virtually opted out—they became vocal supporters of liberalizing Egypt’s calcified system, and it made common cause with other pro-democracy groups. Nathan Brown, a political science professor at George Washington University and an expert on political Islam, is optimistic that the Brotherhood has evolved from its fundamentalist roots: “Their agenda is to make Egypt better,” he told Salon recently. “And their conception of what’s good and bad has a religious basis. So that means increasing religious observance, religious knowledge. It also means probably drawing more heavily on the Islamic legal heritage for Egypt’s laws. They don’t want to necessarily completely convert Egypt into a traditional Islamic legal system. But if the Parliament’s going to pass a law, they want it to be consistent with Islamic law.” No doubt many officials and members of the Muslim Brotherhood would endorse this characterization. But it’s also fair to ask if Brown’s interpretation is too charitable. In 2007, the Brotherhood released a draft political program that included several very troubling proposals, including the idea that Egypt’s government be overseen by an unelected council of Islamic scholars who would measure the country’s laws against the Koran and sharia to make sure governance would “conform to Islamic law.” Since then, various Muslim Brotherhood officials have also made conflicting statements about anything from the role of women to the treatment of non-Muslim minorities. In the end, there’s no getting around the fact that the Muslim Brotherhood is, if not an anachronism, a profoundly reactionary force. Its views on marriage, the family, homosexuality, and the like are distasteful to most Western minds and many Egyptian ones. And it harbors a strong current of overt anti-Semitism, along with a penchant for conspiracy theories. Despite Egypt’s drift toward a more conservative Islamic outlook since the 1970s—which paralleled similar trends across the Muslim world—the Egyptian people, especially the middle class, may in the end not be receptive to the Brotherhood’s message. It’s also worth remembering that when the Egyptian uprising began in January, the Muslim Brotherhood was not among the leaders. At the forefront of the movement were young Egyptians, including those organized around a popular Facebook page memorializing the murder of a young man named Khaled Said in Alexandria. They were joined by a panoply of secular, socialist, Nasserite, and pro-democracy groups, and eventually by Mohammad ElBaradei, the former head of the International Atomic Energy Agency. Nearly all of the movement has been relentlessly secular, though it admittedly gained a great deal of momentum when the Muslim Brotherhood—which had initially held back—threw its weight behind the protests. So Could They Take Over Egypt? Because the Muslim Brotherhood is still a secretive, cell-based organization, and because it operates mostly underground, there are no reliable estimates either of its strength or its potential electoral base. Analysts have placed its membership as low as 100,000 nationwide and as high as a million or more. Similarly, some experts say that in a free and fair election the Brothers would win as little as 10 percent of the vote or as much as 20 to 40 percent—and their share will probably be higher the sooner the election is held, since they are by far the best-organized force at the moment. What Does This Mean for US Foreign Policy? Whatever its ultimate political beliefs, there are several things that the Muslim Brotherhood is not: It is not Al Qaeda or the Taliban. It is a conservative, even ultra-orthodox Islamist group, but it’s irresponsible to compare it to the terrorist groups and armed insurgencies that have preoccupied American foreign policy since 2001. Nor is the Brotherhood the Egyptian equivalent of the Islamic force that seized power in Iran in 1979. For one thing, political conditions are much different; for another, the Brotherhood lacks the network of highly politicized clerics that helped Ayatollah Khomeini succeed in 1979. The group itself is almost entirely made up of laymen, often highly educated, and scholars of Islamic law, not members of the clergy. To the extent that the Muslim Brotherhood’s power in Egypt grows, it is certain to infuse the country with a stronger strain of anti-American and anti-Israel politics. Officially, the Brotherhood has proclaimed that it will abrogate or shelve the Egypt-Israel peace treaty signed in 1978, although in practice doing so might be difficult. It’s also likely to align Egypt more closely with other Islamist groups in the Arab world, especially Hamas, which began as a branch of the Muslim Brotherhood. That would be part and parcel of a growing anti-American trend throughout the region, which has been picking up steam since the US invasion of Iraq and the American refusal to challenge Israel’s stonewalling of a Palestinian state. If after Mubarak Egypt does indeed move away from the United States, it will only be joining Turkey, Lebanon, and even Iraq and the Gulf states. One thing is certain. Having been an important player in Egypt’s political landscape for nearly a century, the Muslim Brotherhood is a force to be reckoned with. It cannot be ignored, and no amount of Glenn Beck-style hyperventilating will change that.